GetLinked® Software Forum • View topic - I am adding new employees to GetLinked PRLink module, but when I pull the payroll report from GetLinked I only pick up some of the new hires. Also, name changes and payroll ID numbers never update? Post subject: I am adding new employees to GetLinked PRLink module, but when I pull the payroll report from GetLinked I only pick up some of the new hires. Also, name changes and payroll ID numbers never update? 1. Customers usually do not want their point of sale (POS) system to set (overwrite) the payroll information (ex. employee IDs, names, job codes, pay codes, rates, etc.) in their payroll system as it is sometimes setup quickly and not as accurate as from the accounting department. 2. 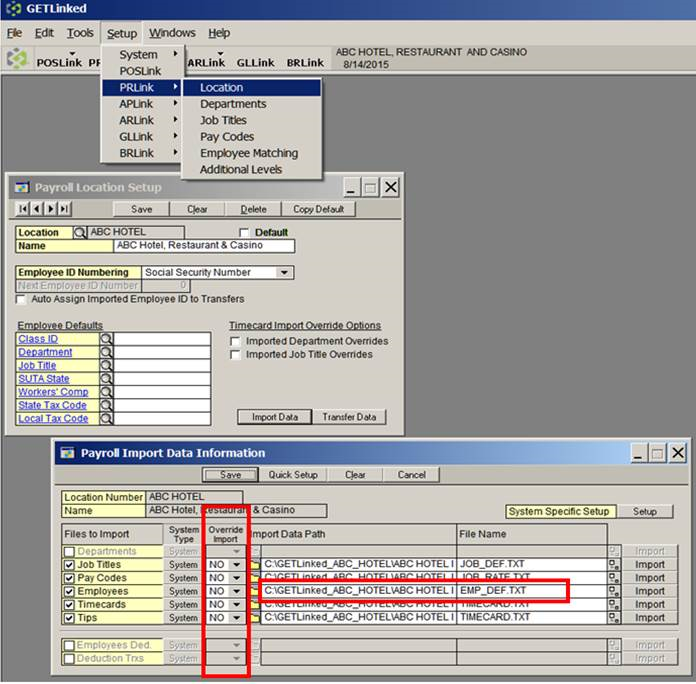 The imported employee and payroll information in GetLinked Software has already been set and verified to run consistently. If there are errors in the POS system they will “override” ALL RECORDS and you may have to fix information that is currently accurate before you re-import from the POS system. If you believe your POS system is accurate and you want to rely on that data then you can change the settings in GetLinked software. We recommend you back up the GetLinked folder prior to making these changes.